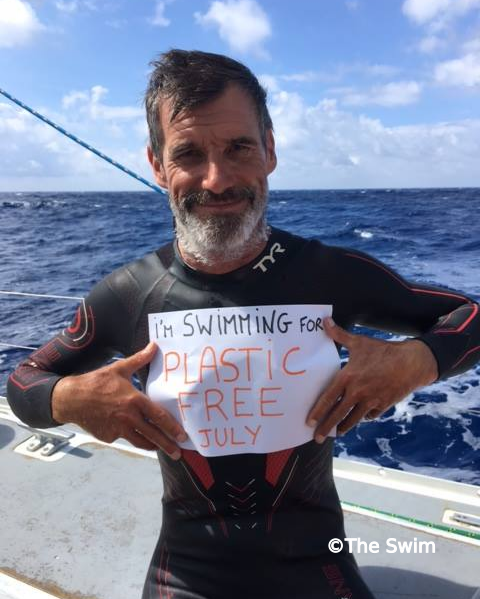 This month is ‘plastic-free July’. The past three weeks have been an interesting time for animal sightings. 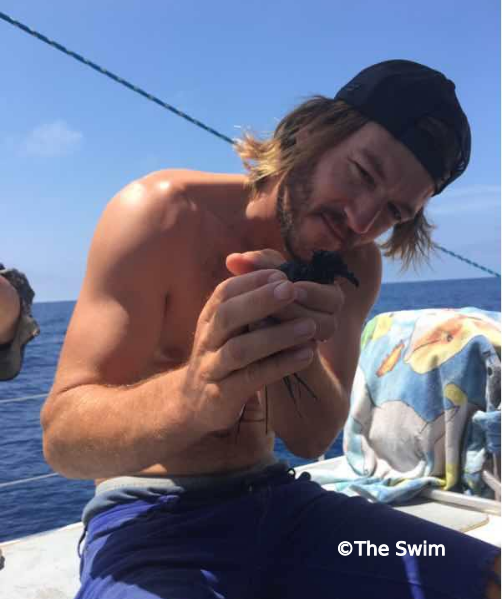 The month of July started out with two shark sightings, including one that was estimated by Maks of the suport crew as being about 8 feet long. Lecomte only saw the fin of one of them. He continued swimming but decided to wear his anti-shark device. Lecomte swimming, support boat Seeker in the background. There was a whale sighting of eight short-fin pilot whales. The crew must have seen them more fully but Lecomte, being submersed, again only saw fins. 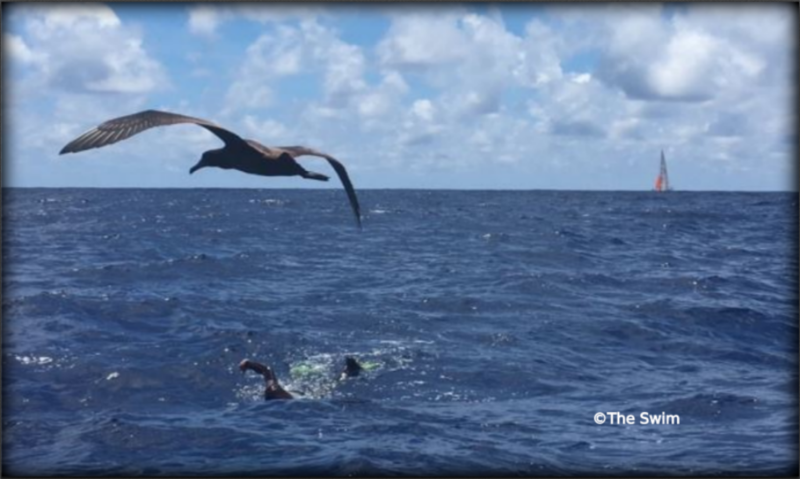 In other ‘animal’ news, Lecomte also picked up a crab ‘hitchhiker’, a black albatross flew along with him for a good portion of a day, and a small bird known as a petrel, severely weakened and starved by endless flight at sea, sought refuge onboard support ship Seeker. They named the bird JunJul and Maks tried to nurture her back to life for several days. 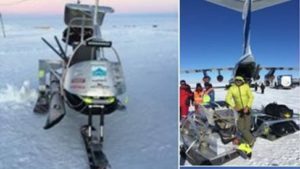 The expedition tracked her progress daily but she unfortunately ended up a casualty of the sea. For several days Maks was trying to nurture JunJul back to good health. 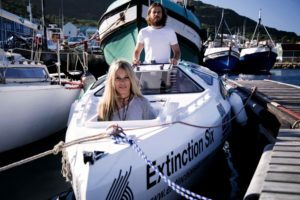 The month of July is considered ‘plastic free’ month, so the team has been trying hard to bring awareness to the plight of our plastic-filled oceans. They have been sharing a photo per day of plastic they’ve been finding but frustratingly they say they’re finding many more pieces than can be displayed. 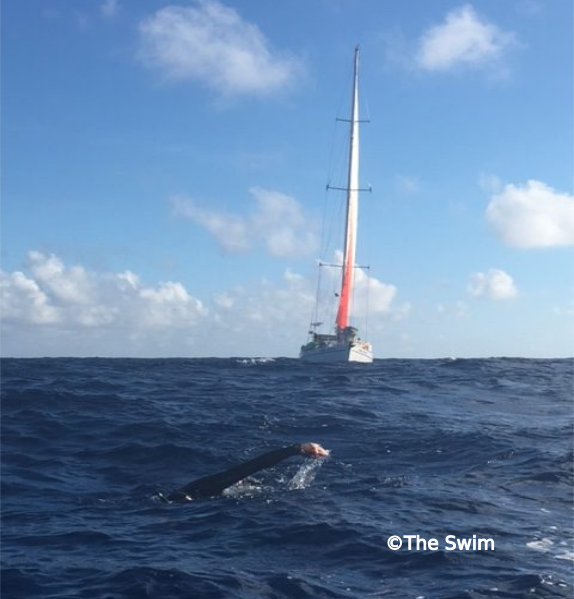 Lecomte has now swam so that he’s about 450 miles from Japan. Overall it’s been a period of calm seas, sun and warm waters abbreviated by some rough, stormy conditions. 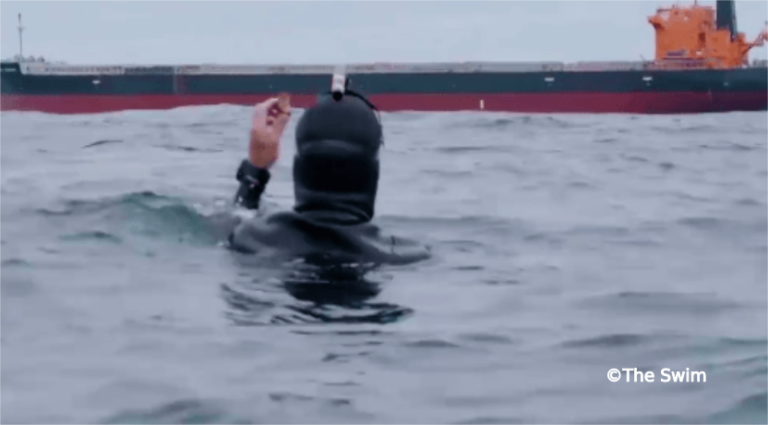 There was a very close run-in with a container ship, whose captain just refused to believe that someone would be swimming in the middle of the ocean. Lecomte has a close-encounter with a container ship. Lecomte also enjoyed a family bonding experience when his nephew Paul came to visit and assisted him out at sea by kayak. Lecomte couldn’t communicate much because he was swimming, but with the monotony of swimming, he busied himself thinking all the times they had spent together. 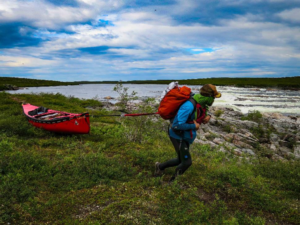 Click here for The Swim’s base page that explains the expedition, contains the latest news, the best photos, expedition links and previous updates.